The nonprofit BTV Ignite has had big plans since its inception five years ago: to help the Queen City capitalize on its speedy gigabit fiber network, jumpstart businesses, retain workers, and spark innovation and growth. But the fledgling organization has been operating on a slim $300,000 budget with a sole staff member: executive director Dennis Moynihan. He took the helm nine months ago and works out of his rented apartment on Colchester's Malletts Bay. In what sounded like a well-practiced spiel, he said: "We have all the pieces in place ... as a community to really take off." The latest "piece" is an infusion of cash for local entrepreneurs. 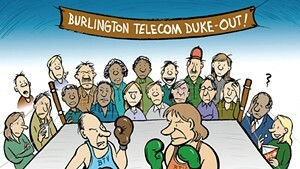 When Schurz Communications bought Burlington Telecom in December, CEO Todd Schurz and New Jersey investor Faisal Nisar promised the city $300,000 annually for 10 years — $50,000 for workforce development and $250,000 for Burlington's tech economy. After the sale is completed later this year, Moynihan will likely administer those funds, said Schurz, though the details have not been finalized. Moynihan, who first set foot in Burlington last April after accepting the job, retains a deep conviction that with the right people, some good ideas and a little momentum, Burlington could be an East Coast tech hub. How? "Just connect the dots a little better between what we're already doing," he explained. The Schurz money, he added, "will double our impact." 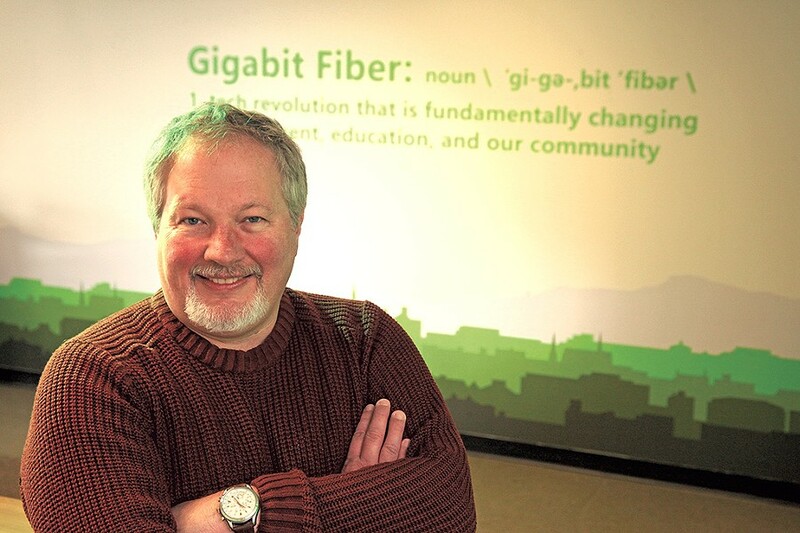 Burlington Telecom general manager Stephen Barraclough started BTV Ignite in 2013 in an effort to take advantage of Burlington's fiber network — "one of the richest, over-engineered fiber networks ever built anywhere," as Barraclough described it. 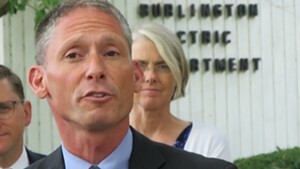 Burlington became one of approximately 25 member cities of US Ignite, a Washington, D.C.-based organization that helps communities build economic vitality using gigabit internet. US Ignite provides grant money to participating cities and offers a platform for them to share applications created by local researchers or businesses, most of which enhance health, education, transportation or other municipal services. Moynihan works with 12 public and private groups that fund BTV Ignite — including the city of Burlington, the University of Vermont, Burlington Telecom, the Burlington Electric Department, the Lake Champlain Regional Chamber of Commerce, Vermont HiTec, People's United Bank, and others — that each put up $25,000 a year and get a seat on the board. "We all acknowledge it's a bit hard to explain and pin down who we are and what we do," said Dan Harvey, who represents UVM on the board and is a founding board member of the Generator makerspace, an incubator for businesses and artists in the city's South End. "We're trying to foster an environment" where tech companies and workers come to Burlington — and stay, he explained. Other board members see the group as a roundtable for collaboration. BTV Ignite brings businesses, entrepreneurs and institutions "to one place to talk and plan and execute on trying to build that vision for the Burlington area," said Neale Lunderville, the general manager of Burlington Electric, who has been on the board since 2015. What's holding the Queen City back? Vermont ranks in the top half nationally for start-up creation but is dead last for "growth entrepreneurship" — a measure that considers the number of high-growth companies and the percentage of companies that "scale up," according to research by the Ewing Marion Kauffman Foundation, a Kansas City organization that offers entrepreneurship grants. Leaders of the Generator, Dealer.com and the Vermont Center for Emerging Technologies say growing tech businesses are similarly afflicted. Their biggest challenges: finding investors and qualified workers. Contributing to that is Vermont's "brain drain." Many college students migrate out of state after graduation, according to UVM's Harvey. 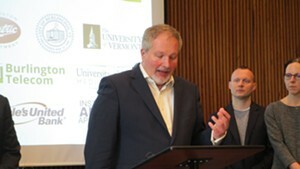 Several Burlington companies and organizations exist to address those problems, including VCET, Accel-VT and the Vermont Sustainable Jobs Fund, Harvey added. Chris Yager, Dealer's vice president of engineering, said he sees BTV Ignite as a useful — albeit small — piece of that puzzle. Beth Anderson, Burlington's chief innovation officer, agreed. "We're still working to find out how to support entities and make the tech economy grow," said Anderson, who serves as one of the city's two representatives on the board. "You have to start somewhere." During its first two years, BTV Ignite existed in name only; it was volunteer-run, with no headquarters or budget, according to Barraclough, who's now chair of the board. In 2015, Barraclough led a charge to revive the group. He brought together eight "anchor institutions," most of whom still sit on the board, to help fund and lead the nascent organization. That September, the group registered BTV Ignite as a nonprofit and hired former Burlington police chief Mike Schirling as its first executive director. BTV Ignite adopted an expansive agenda that included training, education, research, development, recruiting new business, attracting new workers, putting on local events, and helping ensure that students and community organizations are connected to Burlington Telecom internet. "We started with essentially nothing. We were making it up as we go," Schirling said. 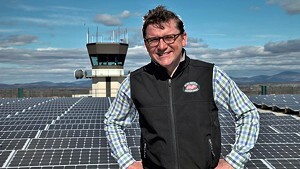 He started the now-annual Innovation Week in 2016, and spent much of his time meeting with groups and businesses and generating a list of priorities. Schirling stayed in the job for 16 months; in January 2017, he left to head up Gov. Phil Scott's Agency of Commerce and Community Development. He still serves on the BTV Ignite board. Though it took six months to hire Schirling's replacement, the position attracted plenty of interest: Forty-seven people applied, from as far afield as Abu Dhabi, according to Barraclough. Moynihan, a 57-year-old Detroit native, came to the post by way of London. He spent 25 years providing IT services for colleges and universities across the U.S., worked as a private consultant in Europe, and helped lead a London environmental and tech nonprofit. In 2014, he joined Europe's equivalent of BTV Ignite — though it served 10 countries. As the London node director, he led an accelerator for tech companies, administered grants and managed innovation work across the continent. Moynihan has adapted to his new gig quickly, said Harvey, despite a "big slowdown" at BTV Ignite after Schirling left. "There's a lot of 'we'll see,' I'll admit it," said Harvey. "But we're all pulling together. You've got a bunch of people who are willing to try." That could be enough, said Yager, of Dealer.com — one local tech business that has scaled up successfully and now employs 1,100 in Burlington. "You get the right people in the room and give them enough money and magic can happen," he said. How, exactly, should BTV Ignite track its success? That's tricky, according to board members. Ultimately, "jobs retained, jobs grown, businesses retained — those are the traditional measures," said Noelle Mackay, director of Burlington's Community and Economic Development Office and one of the city's two board members. But, she added, "How do we measure it? How do we tell our story? ... We're trying to lay the foundation for that. It's not as easy as it sounds." Good thing Moynihan is "ADD-level passionate," as he described himself. In one week last month, he held a gathering for remote workers at a local bar. He discussed a virtual STEM workshop with faculty at UVM and attended a meeting about creating an "innovation district," a cluster of tech and creative start-ups in Burlington's South End. Also in February, he launched a "growth acceleration program" that will provide mentorship to companies that use digital technology hoping to scale up and stay in Burlington. Moynihan and hired business advisors will offer strategy and financing advice to program participants and help them meet space and staffing needs. In May, Moynihan will run a "reverse pitch" competition to come up with innovative tech solutions around the theme of "delivering education." Community leaders and businesses will pose a challenge such as how to improve class offerings in rural areas or use virtual reality to teach science classes. They'll ask entrepreneurs, hackers and developers to come up with solutions. Winning teams will get prize money to prototype their apps. According to US Ignite director Bill Wallace, BTV Ignite has generated more tech and gaming applications than other US Ignite cities, partly due to Moynihan's energy and willingness to experiment. In one instance, Moynihan helped secure funding for UVM professor Dryver Huston, who's developed an app that uses sensors and maps to gauge the status of underground utilities such as water or sewage pipes. It's now being tested in Chattanooga, Tenn., another gigabit city. Moynihan is convinced that, with time, his efforts will bring more jobs and a stronger tech economy to Burlington. The city "has energy and culture; it has authenticity; it has resources," he observed. The transformation won't happen overnight. When Barraclough first launched BTV Ignite, he said he saw the organization's work as a long-term effort that will take 10 — or even 20 — years to come to fruition. "It's a marathon," Barraclough said, "not a sprint."